Choosing Fabric for Outdoor Furniture - Sew What? Sew Anything! One year, over the Christmas holiday, I received a call from a client who asked me to meet with his daughter. 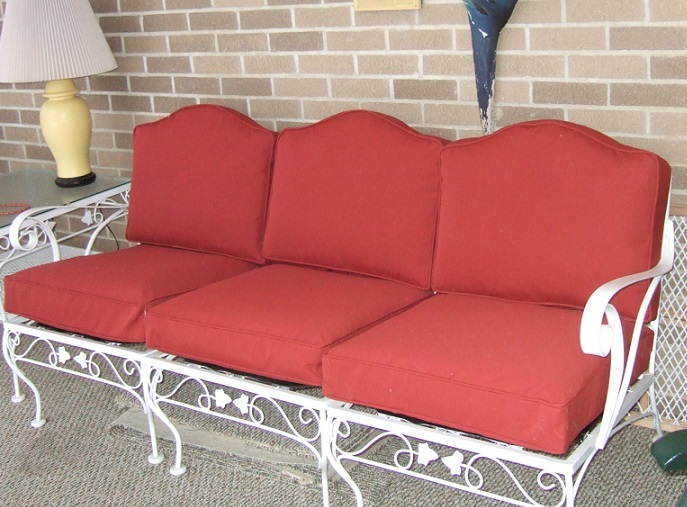 He was giving his daughter the white metal frame outdoor furniture and she wanted new cushion covers made. The challenge was to choose the right fabric for outdoor furniture. My client’s daughter lives in the Washington DC area where there is plenty of good outdoor living time. What a wonderful Christmas gift and the perfect reason to visit his daughter since he was planning to deliver the piece to her when the cushions were finished. These cushions were made with a Sunbrella fabric perfect for outdoor use as this piece was to be used in a covered outdoor area. If a piece is going to be outdoors it is best to go with a fabric designed to withstand the elements, choosing a pretty fabric that won’t withstand the sun and moisture is a mistake for outdoor furniture. This is a great example of how an older piece of outdoor furniture can look brand new with some tender loving care and some new cushions. So if you have a solid piece of furniture tucked in your basement or garage that just needs some new cushions, we can help.